Growing up in Canada, had I thought about it at all, it would never have occurred to me that parody was not protected under Canadian copyright law. After all, parody has long been a major staple of Canadian comedy. Who could forget the classic CBC comedy specials featuring the famed Canadian comic duo Wayne and Shuster? Wayne and Shuster were parody. Generations of Canadians grew up laughing at their comedy. Who could possibly forget Johnny Wayne in Spock ears…? Or a a bald Frank Shuster captaining the Love Boat…? Wayne and Schuster satirized, lampooned and parodied anything and everything over the course of their career which spanned decades. In those days, producers of the American television programs that Wayne and Shuster parodied probably had no idea that Canadian copyright law was any different than American copyright law which does allow parody. It would never have occurred to any of them that they could have sued the CBC on the basis of Wayne and Shuster content. In those days the big media companies were just happy Wayne and Shuster gave them such great free publicity. Canadians have contributed a vast amount to the world of humour over the years. The fact that parody is not protected in Canada is probably one reason why so many Canadians in the funny business have emigrated south. Yet Canadians are always willing to laugh at ourselves and our foibles through parody. Parody helps us let off steam so we don’t take to the streets and storm the Bastille. Yet in today’s world Canadians reckless enough to who commit parody in Canada expose themselves to legal penalties for copyright infringement. There is a powerful scene in a 2004 German movie called Der Untergang in the original German, more familiarly known to English speakers the world over under the name Downfall. This one scene from this film is quite probably the single most re-mixed bit of video in the history of the world. The first time I saw a Downfall parody re:mix it was lampooning ill advised Canadian government activities. 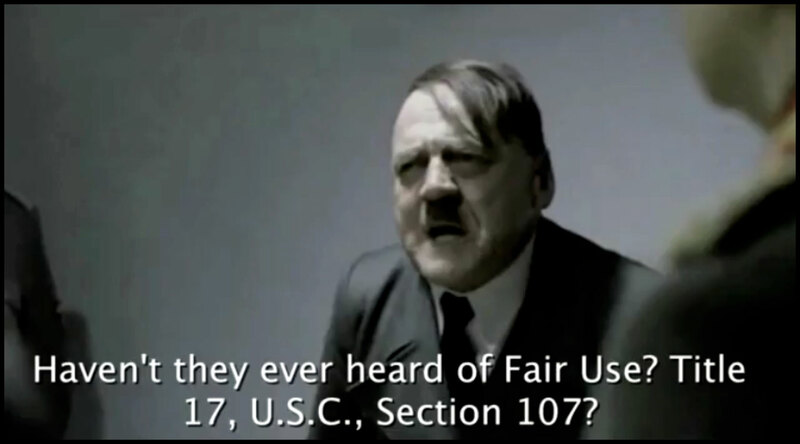 But that was not the last time I saw a Downfall (Der Untergang) parody. There have been many many more. I had never even heard of Constantin Film or Downfall (Der Untergang) before the subtitled parodies of began surfacing on YouTube a couple of years ago. I think that’s probably true for most of the world’s population outside of Germany. But over the last couple of years this one Downfall scene has been subtitled, and subtitled, and subtitled again, and uploaded to YouTube, to illustrate a wide variety of issues and causes. Some are political minefields, while others are purely frivolous, like this anti Comic MS font Downfall parody. 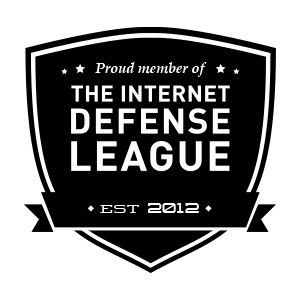 But even though parody has been protected under American law for many years, the American DMCA allows take down notices on the basis of mere allegations. Contrary to the body of law that came before, this reversal puts the onus of defense on the accused, and allegations of infringement are treated as proof, and it YouTube seems to pull videos at any rights holder request, whether under DMCA or not. This puts the accused in the dubious position of guilty until proven innocent. This also means the rights holders can censor parody by saying it copyright infringement. MIT Free Culture has created an internet research project called YouTomb, to track videos taken down from YouTube for alleged copyright violation. You can see their Constantin Film Produktion GmbH results here. A few days back UK blogger Glyn Moody passed along an online article warning of that Constantin Film the company that made Downfall decided to take action against these parodies. 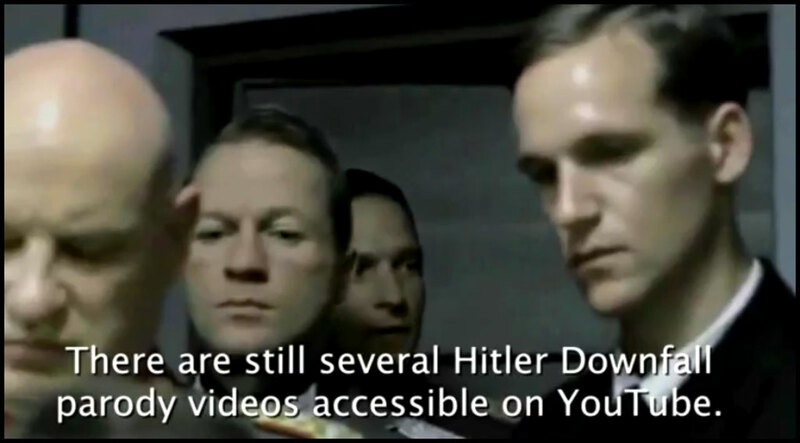 I can certainly understand that the film makers who crafted this ultra serious historical film Der Untergang might have a hard time accepting the fact that what is probably one of the most powerful scenes in the film has been transformed into a re:mix parody meme. At the same time, this has enormously raised the visibility of both the film and the film company on an international level. I know at least one person who intends to purchase a copy of Downfall (Der Untergang) specifically because the scene that has been parodied so many times is clearly so well done. I hope that Constantin Film decides to change their position on this issue. Clearly, they have a name that is now known around the world because of this much parodied film clip. And although some factions of the American Government are pushing for A.C.T.A., United States copyright law does clearly protect parody. Should this go to court, not only will Constantin Films have alienated a vast potential audience, but they are likely to spend a fair bit of money prosecuting an un-winnable court case. what could Constantin Film do? The best idea I’ve heard for a Constantin Film solution was Canadian Bob Jonkman‘s suggestion to release a Downfall YouTube Special Edition. Naturally this DVD set would contain the original film in German, with subtitles in all appropriate languages. The special features would include all the YouTube parodies. Perhaps Constantin Film could even put together a special interactive “make your own captions” feature that would allow you to caption your own and upload it to YouTube. I’m not sure if that would be technically feasible, but if it was I’d guess it would be a huge moneymaker. The beauty of a strategy like this is that it would not alienate a potential global audience, but would instead sell them a lot of DVDs. Once people have bought the DVD, they are rather likely to watch the actual film. This entry was posted on April 23, 2010 at 6:43 pm	and is filed under Changing the World. Tagged: A.C.T.A., accused, allegation, Bob Jonkman, Brad Templeton, Brenda Wallace, Canadian copyright law, CBC, Comic MS, Constantin Film Produktion GmbH, copyright, copyright infringement, Der Untergang, designers daily, DMCA, Downfall, E.F.F., Electronic Freedom Foundation, Free Culture, Germany, Glyn Moody, Haris bin Ali, Hitler, IMDB, Jesse Brown, MG Siegler, MIT, parody, re:mix, search engine, takedown, Techcrunch, Wayne and Shuster, wikipedia, YouTomb, YouTube. You can follow any responses to this entry through the RSS 2.0 feed. You can leave a response, or trackback from your own site.